Coaches take an “Ask vs. Tell” approach. Don’t tell the employee what to do, instead ask powerful questions. This allows the employee to create their own solutions. When they go through the thought process to get to resolution, they are much more bought-in — it’s their idea! Coaching is not about “fixing” anyone. Again, it’s about their development and facilitating the learning process. So how can a Manager behave more like a Coach? ?Ask good questions to enable the process. Meet the employee where they are. Guide the conversation (through questions, not directives) to a mutual agreement of the priorities of development. Ensure that the feedback information is heard and understood by the employee. Again, asking clarifying questions is the best way to do this. Do your part to support the employee through a shared commitment to their goals, responsibilities and action steps. What is the status on “x”? Can you tell me about that error? Why didn’t you do “x”? So are you up for the challenge? 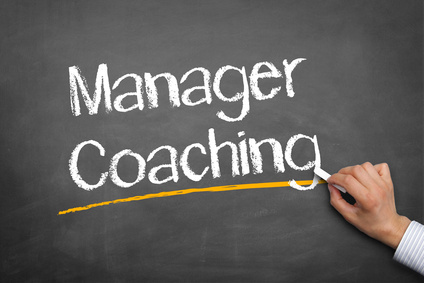 Your employees, the business and your career will all benefit if you begin to operate in Manager-as-Coach mindset. Your employees will be developed and challenged in way that truly builds new skills and enables them to learn from experiences. BONUS FEATURE: Your career will blossom if you are known to be a good developer of people – a critical skill for long-term success!